The transformation of the lobby and one wing of the main academic building at St. Michael's Catholic Academy represents the first phase in a multi-year investment focused on rejuvenating the campus through contemporary design that reflects the school’s high standards. The renovations introduced a consistent design approach that emphasized light, transparency, and technology. A core of labyrinthine administrative offices was replaced by an L-shaped block containing a study hall and tutoring/conference rooms for individual studies or small classes. Glass walls on two sides open up toward a new student lounge illuminated by a large round halo that takes advantage of an existing double-height space with clerestory windows. Computer banks and outlets for students’ laptops were added throughout, as well as a smart projector in the conference room. An existing reception vestibule was removed from the lobby, which was outfitted with new furniture, finishes, and lighting. A wainscot of painted wood ribbons runs continuously around the perimeter of the student lounge and lobby. In the adjacent language and sciences wing, newly transformed classrooms and counseling areas give shape to the school’s vision of a student-centered academic program. 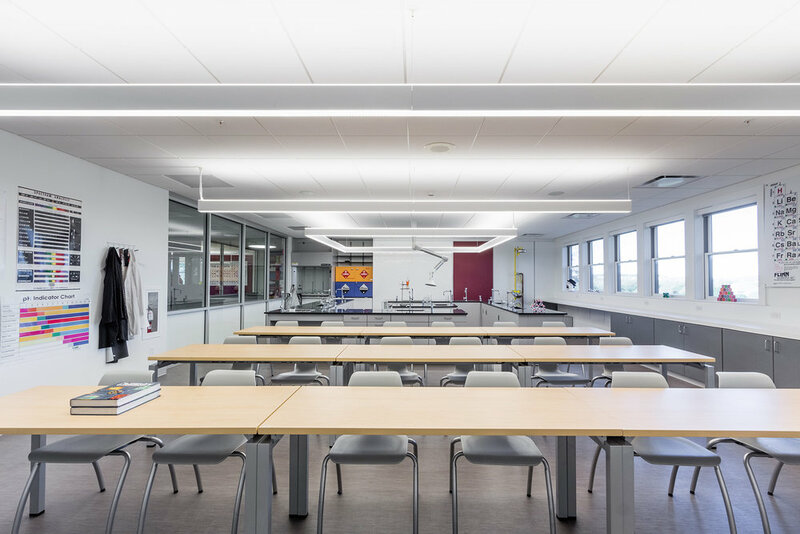 The existing laboratories and classrooms were completely overhauled with improvements to lighting, furniture, A/V, and finishes. LED lighting, occupancy sensors, and window shades improve energy efficiency, while new smart projectors provide greater flexibility to instructors. The hallway was enlivened with floor-to-ceiling dry erase boards used for breakout sessions, and large windows that allow views into the classrooms and labs.